When it comes to a sweaty summer workout, we love a water break reward as much as the next fitness fiend. But as the mercury rises, it’s more important than ever to focus on our fluids all day long. After all, water is the most essential nutrient our system needs. While it’s true a tall glass of water is the best known way to stay hydrated, there are plenty of alternative options if you don’t like the taste of tap or couldn’t be bothered with bottled water. Sure, you can infuse plain ol’ drinking water withflavorful fruits like lemons and raspberries. But you can also reach for some of these water-rich foods and fluids that keep the H2O balance just right—and won’t require so many trips to the water cooler! Who says you can’t have your water—and eat it, too? According to the Institute of Medicine’s recommendations we should eat 20 percent of our daily water intake. Soup, yogurt and oatmeal are all great fluid-filled foods, but these summer-friendly fruits and veggies can also help with hydration. Next time you’re feeling thirsty, pile these on your plate. 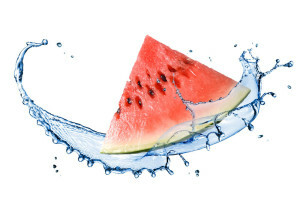 In the world of thirst quenchers, watermelon weighs in as a major contender. Based on its name, it’s no surprise this fruit is made up of 92 percent water! But its salt, calcium and magnesium is what makes itideal for rehydration, according to a 2009 study at the University of Aberdeen Medical School. The summertime staple is also a good source of potassium, vitamin A and vitamin C.
No matter how you slice ‘em and dice ‘em, cucumbers keep cool at the number one spot on the list of water-logged fruits and vegetables. 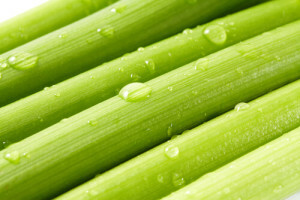 At 96 percent water, cukes have no saturated fat or cholesterol, and are very high in vitamin K, vitamin B6 and iron. Cucumber and melon bites, anyone? 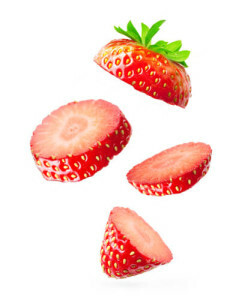 Even without the shortcake, strawberries are a sweet treat perfect for staying hydrated. They are 92 percent water (the most of any berry) and are loaded with fiber and vitamin C—as if you needed an excuse to sip on this refreshing summer cocktail! Iceberg lettuce may be 96 percent water, but it’s not known for much else in the nutrition department. Richer salad greens and sandwich toppers including butterhead, romaine and spinach are more well-rounded choices and still up your hydration. Need some inspiration? Start with these creative, healthy salads. 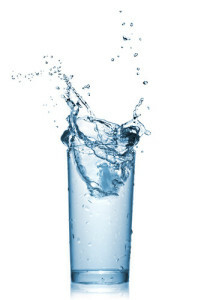 Most beverages (non-alcoholic, of course) will help contribute to your daily water intake. 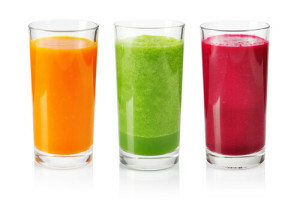 But here are five drinks that will give you some extra benefits, too. Yes, even coffee! Everyone knows milk is an excellent source of calcium that will keep your bones in tip-top shape. But research also shows milk is better than water and sports drinks for rehydration and recovery after exercise (yup, especially chocolate milk). Just be sure to choose a slimmed-down carton since the fat in whole milk can delay fluid replacement. Can’t choose just one hydrating option? Slurping down a DIY smoothie is a great way to combine your favorite flavors into one nutritionally-packed glass. “And it only takes seconds to scarf down!” says Berman. Try drinking your fruits and veggies with these healthy (and tasty) green smoothie recipes. Sugar and sodium are good things when it comes to sports drinks! In addition to the electrolytes and protein included in most on the market, the sugar and sodium can bring your body back to balance faster than water after a grueling workout lasting over 90 minutes. For shorter workouts, sports drinks may just mean a lot of extra carbs you don’t need. To cut some calories (and save some money), make your own sports drinks at home. There’s a reason people go nuts for this tropical drink. Unlike sports beverages, coconut water is low in carbohydrates, while still rich in potassium. And its unsweetened varieties can be very hydrating (assuming you like its unique taste). According to a study in the Medicine & Science in Sports & Exercise, the all-natural beverage is effective in rehydrating after light exercise. But for more rigorous sweat sessions, the low-sodium drink does come up short in replenishing the salt your body loses. Isn’t coffee a diuretic? Well, yes, but a recent study in PLOS ONE debunks the myth that it also causes dehydration. Not only will your daily cup contribute to your water needs, coffee can also give you a sharper memory, boost athletic endurance and performance, and reduce the risk of many serious ailments including diabetes and heart disease. Whether you eat it or drink it, don’t stop ‘til you get enough. According to Berman that’s not as simple as the old-school “eight glasses a day” rule we were all taught. Most of us need this reminder, as we may not even realize we’re dehydrated—until it’s too late. While common signs of dehydration include fatigue, headaches, nausea and dizziness, Berman says the best (and easiest) way to see if you’re getting enough water is to take a peek at your pee. Source: www.thedailybeast.com; Emily Faherty; July 25, 2014.